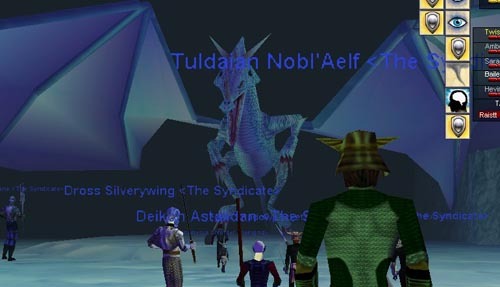 Everquest is a game that, at the higher levels, demands the grouping of players in order to visit certain zones or fight certain monsters. However, even the most team oriented and strong groups dont win every battle but you will surely lose every battle if you dont form into them. There some zones in the game that you go to them expecting to die over and over to "break" the spawn so you can hunt there normally. Since grouping up is required and since it helps build teamwork and fun for all members, The Syndicate, put together a Raids Team to plan 2 or more raids per week for its members. A raid is defined as a hunt to a specific, very hard, zone (often to a specific room within that zone) for the purposes of killing a certain monster or getting a certain item/items. To be successful in a raid you need a knowledge of the zone, good communications, teamwork and the right mix of people. The Syndicate, due to its organization and its size, had all of this in spades. An example of the things needed in a raid include: a monk to pull (his feign death skill is crtical). Clerics to resurrect and heal. Enchanters to mezmorize (stop some monsters from attacking). Warriors to tank and dish out damage and absorb it. Casters to blast monsters with high powered spells. Working together, in the right combinations, most battles could be won. That is Vox. Vox is one big, mean dragon living in her lair and she hates to be disturbed. Here henchmen and minions make even getting to her a daunting task and killing her even more so of one. Here you see the lead group of a Syndicate Raid launching an attack upon her that ultimately ended in her death as well as the deaths of many of the team. The Syndicate has a tradition of excellence in doing things professionally, maturely and being among the most successful at them. To their credit they were among the first into the zone "The Hole" when it was opened. They were the first to do an open, full spawn break of the Plane of Fear since Kunark was released (and the monsters made harder). They have killed both Nagagen and Vox (the 2 mighty dragons). They have killed the ancient dinosaur, slew Phinny, raided karnors Castle, conquered Sibilis, laughed at death in Chardok and much much more. All over Norrath, whereever there is a challenging zone, you can be sure, sooner or later, a Syndicate army will arrive to conquer it!